An elementary school principal is apologizing over a mock ‘Donald Trump’ tombstone that was spotted at a Halloween party in Massachusetts. 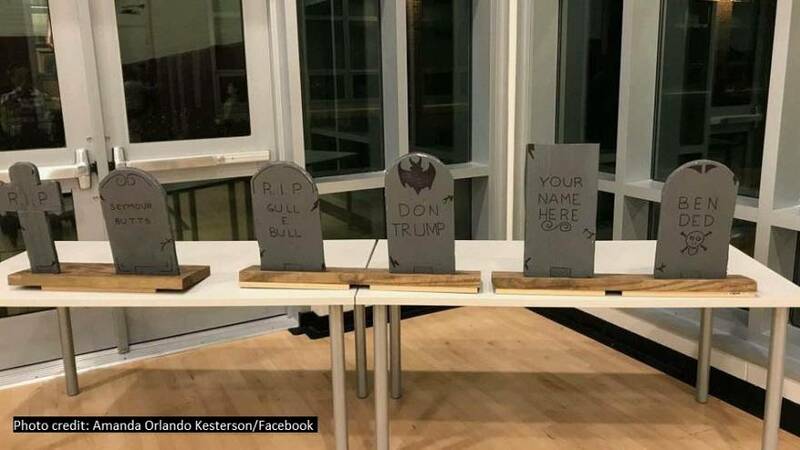 The school hosted a Halloween-themed fundraiser and one of the games involved tossing bean bags at fake tombstones, one which bore a ‘Don Trump’ inscription. Enraged, some parents reportedly sent pictures of the decoration to Massachusetts Republican Party committeewoman, Amanda Orlando Kesterson. The school’s principal, Telena Imel has released an open letter apologizing and claiming that the controversial gravestone was brought in by a parent. “It inappropriately brought a political agenda into what was designed to be a fun family affair”. Imel concludes, using a similar discourse to Keterson’s, that school events are not the place for politics or to “display political agendas”.